The Rev. 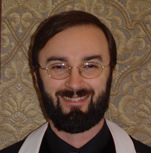 Dr. Peter J. Wallace is a minister in the Orthodox Presbyterian Church, and is the pastor of Michiana Covenant PCA in South Bend, Indiana, where he resides with his wife, Ginger, and their seven children. He graduated from Wheaton College (B.A., 1993), Westminster Theological Seminary in Philadelphia (M.Div., 1996), and the University of Notre Dame (Ph.D., 2004). His dissertation was entitled “The Bond of Union: The Old School Presbyterian Church and the American Nation, 1837-1861.” He has lectured widely on the history of the church and of its worship, and has published articles in the Westminster Theological Journal, The Journal of Presbyterian History, and the Mid-America Journal of Theology. Dr. Wallace was previously the organizing pastor of Grace Reformed Church (OPC) in Walkerton, Indiana, and has served on several committees for the Orthodox Presbyterian Church, including the Committee to Prepare Proof-Texts for the Larger Catechism and the Committee on Views of Creation. He presently serves on the Committee on Ecumenicity and Interchurch Relations.